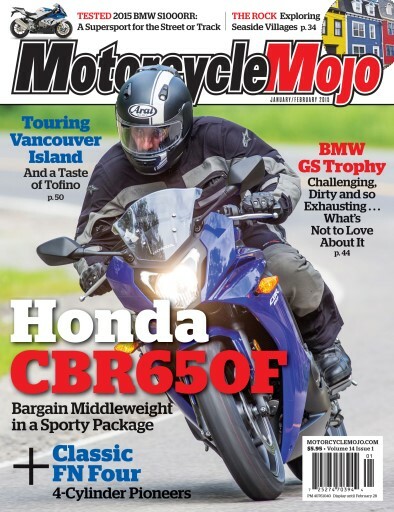 In our January / February 2015 issue we take a close look at the 2014 Honda CBR650F. Designed from the ground up, this bike is sure to please the new rider while keeping the experienced rider entertained. BMW is staying ahead of the class and has implemented some serious changes for their Supersport S1000RR. Motorcycle Mojo travels to Circuito Monteblanco, a tight, point-and-shoot Spanish racecourse where we discovered the latest S1000RR will not disappoint the converted. We also go coast to coast for the travel stories in this issue. On the far west coast is a getaway on Vancouver Island, while the far east coast of Newfoundland sets the stage for our eastern travels. All this and much more.